DeltaVision® eye care benefit plans are available to a wide range of companies, from employers with at least 10 employees, up to and including the largest employers. We have plans available for fully-insured, self-funded and voluntary programs. Our plans offer coverage for exams, frames and lenses or contacts, coverage for LASIK vision correction and unique coverage for specialized lenses, including photochromic and progressive lenses. Unique benefits of DeltaVision® that are not common with other carriers include: an allowance for photochromic lenses, an allowance for progressive lenses and full coverage for polycarbonate lenses for children age 19 or younger. 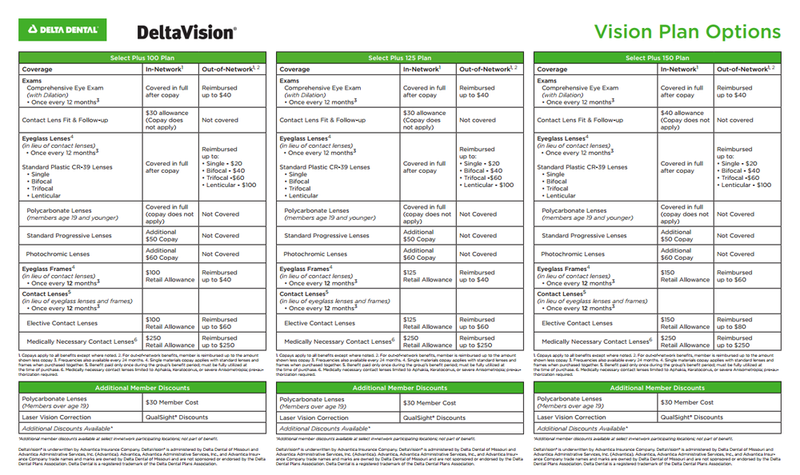 Our DeltaVision® Value Discounts program delivers even greater value and more savings. In addition to receiving covered benefits, members also get special deals on popular extras. Click here to view the discounted services and materials available at participating discount provider locations.